Over the last decade behind the bar designing cocktails… and in front of the bar drinking cocktails….My philosophy has followed a path to a kind of minimalism in cocktails and food. By saying minimalism, I do not in any way mean simple or minimal in taste or aesthetics. Playing with the taste profiles, textures and aromas of 3 different ingredients can create a masterfully complex and delicious cocktail. A cocktail that celebrates the base spirit, rather than overwhelm it or cover it up with competing flavors or gimmicks. By embracing this philosophy, the focus is on the base spirit and the details surrounding your drink rather than on the one upping use of extravagant garnishes, competing spirits and other ingredients. It might not be as flashy as using 5 ingredients and barrel aging it or carbonating it, but the beauty is in the harmony, the simplicity and the taste and in respect for the ingredients that are being used. Another part of this philosophy is the attention to intangible details as an important part of each cocktail. Glassware, ice, balance and ratios, types of mixers, etc… Every part plays a role. It’s in the glass. This philosophy is not exclusive or black and white. It does not mean there is not a place for different styles or types of cocktails that may not technically follow this philosophy…Tiki drinks, for example…and the term “balance” is a matter of ones own taste….and that overrides everything. But a philosophy is more about how you think in general terms about the craft or art that you pursue, rather than enforcing a rigid set of rules. A Manhattan cocktail is a beautiful example of this philosophy. Base spirit, say Rye, secondary spirit, say Italian vermouth, a 3rd bittering agent, being bitters and a simple useful garnish, say a cherry or lemon peel. These simple ingredients can be made into a wonderful cocktail or destroyed depending simply on technique, balance, spirits, glassware, or ice. They can also be the starting point for improvisation on a theme. The type of whiskey or cognac or other dark spirit you use…the secondary spirit that you use…the kind of vermouth you use…or what you replace the vermouth with…Carpano Antica, Punt e Mes, Dubonnet…the balance and ratio you use…2-1, 3-1 etc..The bittering agent you use….the ice you use….the technique for chilling…the glassware you use…up or rocks…..All of these issues can make the simple Manhattan into a whole genre of cocktails based on a that one simple theme. With the “more is better” philosophy, the base spirit is often hard to even recognize in drinks. If the base spirit is, say 2 oz, and you have 4 other ingredients, at a mere .5 oz each, you now have overwhelmed that base spirit. It becomes a smaller part of the overall drink. Very often the base spirit is base only in name. 1.5 oz gin can be overwhelmed quickly. Another issue with overwhelming the base spirit is imbalance. A gimlet, I believe, should be all about the gin in a style like a Martini, but made with lime juice and simple syrup (especially 1-1 syrup) it often ends up being the minor player, rather than the star. How many times is your Gimlet made with a mere 1.5 oz of gin and then a combination of 1.5-2 oz of lime and syrup? Mixing it, instead, with 2 oz of gin and 1/2 oz of a preserved lime cordial or lime sour makes a beautiful and balanced cocktail and a much different one than the lime and sugar combo with some gin in it. This overwhelming of the base spirit happens all the time with sours, daisies and other drinks with citrus and sugar or simple syrup. Long drinks like the Gin and Tonic, the Tom Collins, and the Moscow Mule are all base spirit and mixer. The beauty here is that with the few simple ingredients, more attention can be made to balancing and to details. Details like style of simple syrup, ice, styles of mixer and serving temperature of sodas or tonics, citrus, balance of mixer to spirit, size of glassware and many other non-ingredient specific focus can play a huge role in how the drinks taste or come off. The difference between a long gin and tonic or soda made with room temperature mixers and spirits and those that are chilled and before hitting the ice in the glass is monumental, but rarely noticed. So why should we talk a about things like the philosophy of cocktail making? I believe the evolution of the cocktail movement, and it’s renaissance, cries out for such discussions, debates and criticisms. The fast growth in the cocktail and spirit world has created an alarming amount of bad drinks, group think and smarmy bartenders. There has been such an influx of, and demand for, new bartenders and mixologists/bar chefs with the resurgence of the new cocktail movement in the last decade that it has experienced the typical pains of growing too fast and haphazardly for the creators and the consumers to keep up with. There is also a learning curve to deal with for all of those new cocktail creators. In this frenzy it’s easy to lose our way or forget the point….the renaissance of a well crafted cocktail…and the reasons behind it. The culinary world has experienced the same thing and is still going through many of these pains as it continues to evolve. Movements that grow so fast and furiously like these experience peaks and pullbacks much like the tides do. It is the beauty of the evolution of a system or movement. And when any movement gets so disharmonious that it creates a backlash by the public and industry players, it will generally force a weeding out of the pieces, fads and players that do not have staying power and find some more balance. How does this happen and why? The media/industry’s search for, and creation of, bar stars added a lot of fuel to the fire and, like a gold rush, attracted anyone and everyone who thought they could pick up a shaker and be a master of cocktails and bartending. Many can do it…but many more cannot…or should not. The desire for fame and fortune is not a replacement for the dedication and love of your craft. Egos and competition for attention in any movement can create a kind of one-upsmanship. The cocktail world is no different and we have experienced a kind of arms race of spirits, ingredients and gimmicks much to the detriment of thoughtful cocktail creation and service.It also created a nebulous world of “Cocktail Quackery”….self proclaimed “masters of mixology”..With so many calling themselves mixologists, it makes it difficult for the consumer, the journalist or the bar/restaurant owner and even other bartenders to know who is real and who is a pretender. But in the long run of this evolution, most of the good ones get better and stay, and many of the bad ones dont, and leave. The whole movement refines itself and evolves and will continue to go through phases like this. After creating or making a drink or cocktail, the first questions I ask myself are “would I drink this cocktail I just made?” and “is this drink balanced and is it what I had envisioned it to be?”. I often wonder if many drinks are critically tasted before being included on a menu or offered up for competition. I can’t tell you how often I have tasted a horrible drink in many aspects and asked myself the question “Mr Mixologist..Have you tasted your own drink and do YOU like this drink?” and “what was the purpose of all these ingredients in this glass?”, or is it more about you than the cocktail? And this begs the question on forcing multiple ingredients to join in harmony in one glass. Not that it can’t be done, but real care has to be used in thinking how, say, Rhum Agricole, Yuzu, Root Beer-Chocolate-Chipotle-Mole Bitters, spanked Sage and a float of Mezcal really work together. Or is it just a flavor wheel gone berserk? While someone might like this, and I respect that…I think these are fair questions to ask about the thought process that went into making these drinks, besides these ingredients being cool and trendy and “I’m a Mixologist”. But we all have unique palates and palates that are in different stages of maturity. If someone likes something and a reason for liking it, I find it hard to argue with them. The only thing we can do is offer to share our knowledge and experience…That is how we all grow and mature and we are all capable of it. A more mature or different palate might be used as a source of superiority, but it is a sign of personal immaturity to do so. It is actually the opportunity to share your knowledge in a positive fashion rather than as an outlet for your own insecurities. And we all live in glass houses. The pretentious “mixologist” who rants against flavored vodka or Comsos is often the bartender who asks for a Miller High Life when off the clock. Personal minimalism can have roots in just purely enjoying a base spirit neat. Add a lemon peel and ice and you now have 3 ingredients in a simple cocktail. It all starts with the base spirit and grows from there. It can be as simple as a true cocktail: spirit, sugar and bitters in tasteful (your own taste) proportions. But that idea can be taken to other drinks and built into them. An expanded view of this might be something like this. You have a taste for gin. You add some ice to your gin. You may stir it which adds another dimension via technique. You want just a little more to enhance your gin. You might add a tasteful amount of vermouth or other aperitif and a lemon peel. Many details can affect your cocktail. Do you throw away the lemon peel or use it in the drink as a garnish? Is the drink going to be up or on the rocks? What kind of glass will you use, and will it be chilled? How much of each ingredient are you going to use and in what ratio? What kind of gin do you want to use and does that affect what supporting ingredients you use? You still simply have your gin, but enhanced it immensely by two tangible ingredients, and many more intangible ingredients. Attention to details rather than just more tangible ingredients. Balance is really about ratios. It also is affected by things like glass size, ice and technique. In another article on simple syrup, I wrote about sugar to water ratios. A Rationale of Sugar Syrup in Cocktails The original rationale of making a simple syrup was to simply make the sugar soluble for mixing. With that in mind, what you really want is liquid sugar…The more water you put in, the less sugar you have to balance your cocktail and the more water you have to imbalance your cocktail. It doesn’t mean you make sugary drinks, it just means you use less water. When 1-1 syrup is used along with lime juice, you end up with more liquid than you want to balance each other. Think about the difference that a real lime sour, made by mixing sugar and lime juice and skipping the water all together, can make in your cocktail. You now have a concentrated flavor that is balanced and can expand beautifully in the shaken cocktail. I always suggest pre-making fresh lime and lemon sours for use behind the bar. Perfectly balanced, ready to use, fresh, and faster to use. You can make a beautiful Margarita with an emphasis on the tequila balanced with triple sec and a splash of lime all working together to be a refreshing cocktail or an out of balance acid bomb. A Margarita made with 2 oz of Tequila and a full ounce of lime juice is a mess in the making. The Tequila should be the dominant spirit and built smaller from there in ingredients. Think about the triple sec and lime together as a kind of sour mix. Once that is balanced, you can then mix in perfect balance with the tequila. A typical mistake, by my taste, is adding too much lime juice and then overwhelming the dry sweetness of the triple sec. or even worse, using agave nectar. Agave nectar coats your palate and needs to be cut for it to be mixable. It also weighs down your tequila with that heaviness. But in any case, once the acid and sugar part are out of balance, you cannot make a good cocktail with them in any shape or form. The Cointreau Margarita calls for .75 oz lime juice and 1 oz of Cointreau and 2 oz of Tequila. This is balanced 2 /1/.75, and I would even go further and make it .5 oz Lime and 1 oz Cointreau. Cointreau is a little dry and not syrupy sweet. But with 1 oz of lime juice….and the .25 extra make a big difference…your triple sec sour is imbalanced and is equal parts with the Tequila. The Tequila actually dilutes the triple sec as well by stretching it out so it isn’t overly sweet and that is why .5-.75 oz of lime is all that is needed…in my opinion. A Sidecar follows the same principle. A good Sidecar, in my opinion, should be all about the Cognac that is then heightened by the addition of a balanced triple sec and lemon juice combination and the melt from the ice in the shaker. Instead of the acid bomb, you should have a delightfully refreshing and easy to drink cocktail with the background of sweetness and acid and orange. The complexities of this simple cocktail are deep. 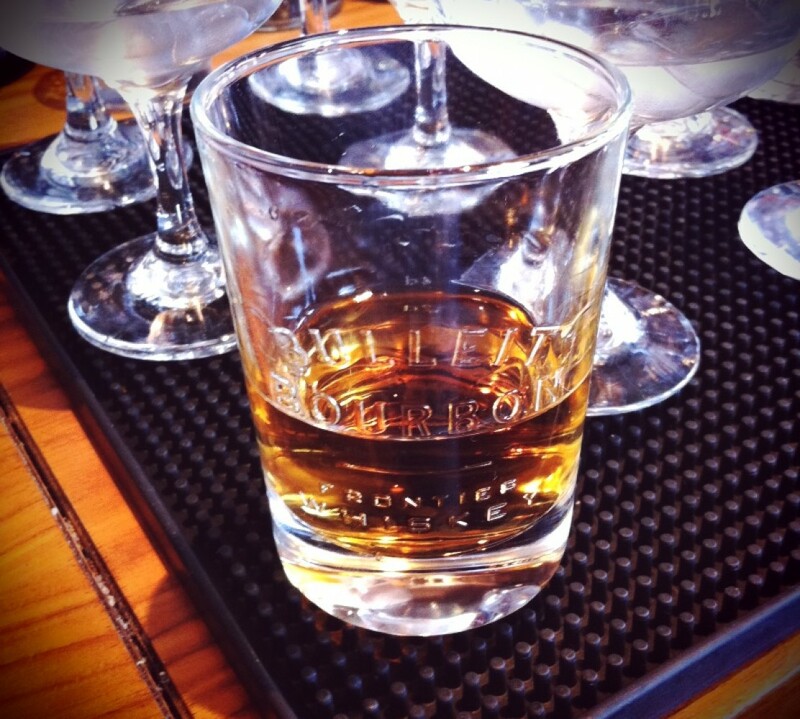 The flavors and aromas are balanced and in harmony, yet distinctive. It is easy to make this cocktail balanced and delicious, but even easier to make a mess. This principle can be used in most drinks. It starts with the base spirit. It includes balance, ratios and proportions; technique, glassware and ice. One might even take it to another level and consider the occasion, the environment, the theme or food being served, time of year or climate. By focusing on these details without simply relying on the forced melding of several pop tangible ingredients, you are giving the ingredients that you do use the attention they deserve and attainment of harmony in your glass. 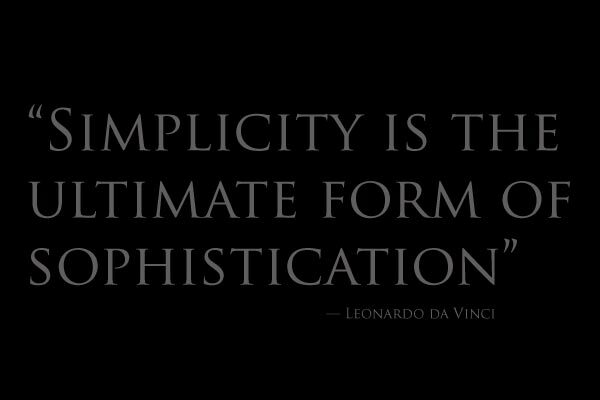 Simplicity in this fashion does not mean simple. It just means the cleaning up of cocktail clutter and expanding attention to details surrounding your cocktail with an eye to balance. It also needs an understanding of what you want your drink to be and taste like and how you are going to get there.